In January this year, over a hundred trainee mountaineers rappelled down Tenzing Rock, a natural rock in India’s Darjeeling city, named after the legendary Sherpa Tenzing Norgay who with Sir Edmund Hillary became one of the first men to summit Mount Everest in 1953. 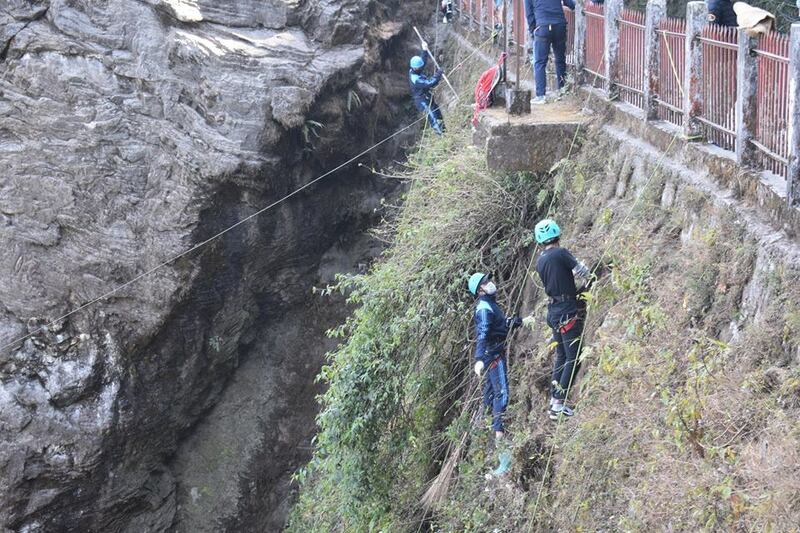 Nothing unusual about this activity at the historic rock, where the sherpa is believed to have himself honed his skills. The rock is also a training site for the Himalayan Mountaineering Institute, a prominent landmark in Darjeeling, in the eastern Himalayas. But there was more to the exercise than met the eye. Armed with gunny bags and brooms besides their usual rock climbing gear, these individuals from Nepal under the aegis of the Himalayan Mountaineering Institute, fanned out across the rock descending into its crevices and nooks. Accompanied by HMI staff and 50 instructors, their efforts over two days yielded four trucks or roughly 200 kilograms of trash of all kinds, from multi-layered plastic to glass bottles, offering a glimpse into the waste problem in the mountains. Darjeeling is a colonial-era city, with one of India’s oldest civic bodies, ranked as one of the dirtiest cities in India. “Even shopkeepers in the vicinity joined in. We also improvised and developed a system to haul up the litter using carabiners. Cleaning is incorporated in all our courses and twice every month we plan to replicate this activity in various spots across the city that faces a huge problem of littering and waste management,” said Group Captain Jai Kishan, HMI principal. “As mountaineers, it is our responsibility to keep the mountains clean and generate more awareness among tourists and the local community,” he said. According to reports, commercial mountaineering has turned Mount Everest (which can be viewed from Darjeeling’s Tiger Hill) into the world’s highest rubbish dump and as glaciers melt due to global warming they expose the trash that has accumulated since Edmund Hillary and Tenzing Norgay summited Everest in 1953. 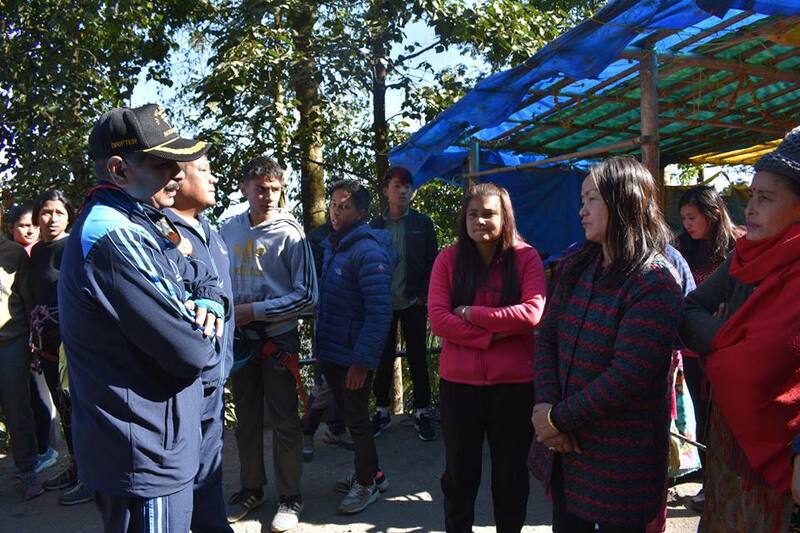 Jai Kishan said the institute is open to training Darjeeling’s municipal body personnel if they need the expertise to collect trash from difficult-to-access sites, drawing attention to the historic way of dumping garbage in the ‘Queen of Hills’– by rolling trash down the hill slopes. This practice that has been in place since Darjeeling’s inception in the second half of the 1800s, has led to the creation of a “historic pile of garbage”, said Roshan P Rai, a development worker with DLR Prerna, a Darjeeling-based NGO. “Tourists do litter but we don’t have really good systems in place and the bigger picture is we are just rolling trash down the hill. And we actually don’t treat our waste, it is just rolled down the hills so there is a historic pile of garbage in the city,” Rai said. In 2007, a 10-year-old girl was killed when an avalanche of garbage slid down the hill burying the child. Trash finds its way into overflowing garbage vats, drains and ‘jhoras’ (waterways) pockmarking the city that was originally planned for 20,000 to 30,000 people and has now grown fourfold to more than 1,20, 000. 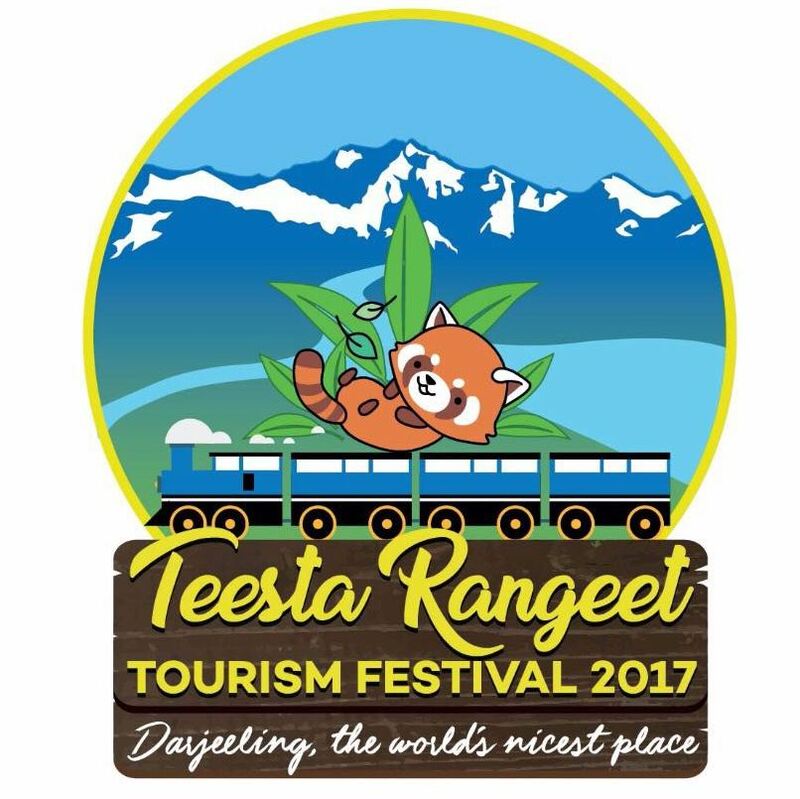 On online travel platforms, tourists often complain of a “dirty view” while traversing the landscape in the Darjeeling Toy Train. The profile of waste generated has also changed dramatically over the years making it difficult to tackle the burden. “Because we have such an old history, there is a site within the town for managing waste which is the ‘Dumping Chute’ below the Hindu Burial Ground. Since colonial times, this is where the waste was thrown or managed. Earlier it was mostly biodegradable so it was manageable, but now with the mixed waste (with multi-layered plastic, single-use plastic) thrown down the hill, the problem has magnified,” Rai explained. “But we do have a dedicated land in the hills and the municipality is unique in that sense. 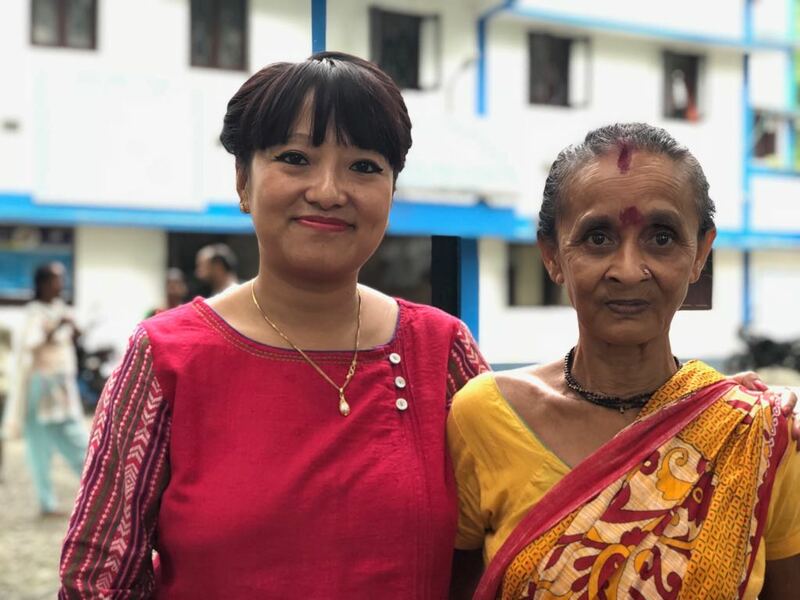 It can be easily converted into a system,” observed Rai, a core team member of the Darjeeling Chapter of Zero Waste Himalaya, a platform that advocates the Zero Waste approach: eliminate rather than ‘manage’ waste. National Environmental Engineering Research Institute (CSIR-NEERI) in a 2016 studyhad shown that the plastic composition of the municipal solid waste generated is “quite high” in 12 high-altitude cities in India. In last year’s (2018) Himalayan Cleanup campaign organised by the Integrated Mountain Initiative (IMI) and Zero Waste Himalaya, that ranged across 12 states, waste audit from 89 sites spread across the Himalayan states revealed 97% of the waste collected was plastic. In the same year, the civic body in Darjeeling started dismantling garbage vats to make way for a door-to-door collection system. “It is a good start but it’s not good enough if you want to look at linkages to recycling, extended producer responsibility (EPR) or even composting all our waste which could be done,” said Rai. “There have been attempts in the past at setting up biogas units but we do not have basics in place. There is no segregation at source, addressing tourist sites, waste from hotels,” he explained. EPR is a policy approach under which producers are given a significant responsibility – financial and/or physical – for the treatment or disposal of post-consumer products. At present 62 million tonnes of waste is generated annually in the country, out of which 5.6 million tonnes is plastic, 0.17 million tonnes is a biomedical waste, hazardous waste generation is 7.90 million tonnes per annum and 15 lakh tonne is e-waste. India in 2016, revised the Solid Waste Management Rules extending them beyond municipal areas to urban agglomerates and industrial areas. In the case of hilly areas, land for construction of sanitary landfills in the hilly areas will be identified in the plain areas, within 25 kilometres. The Plastic Waste Management Rules notified by India in 2016 incorporated the EPR concept. “EPR even though mandated in the rules make it a challenge in the mountains in terms of collection and transportation. There is a definite shift in the way stakeholders are looking at mountain waste. Waste in mountains must be looked at in a separate way,” added Rai. 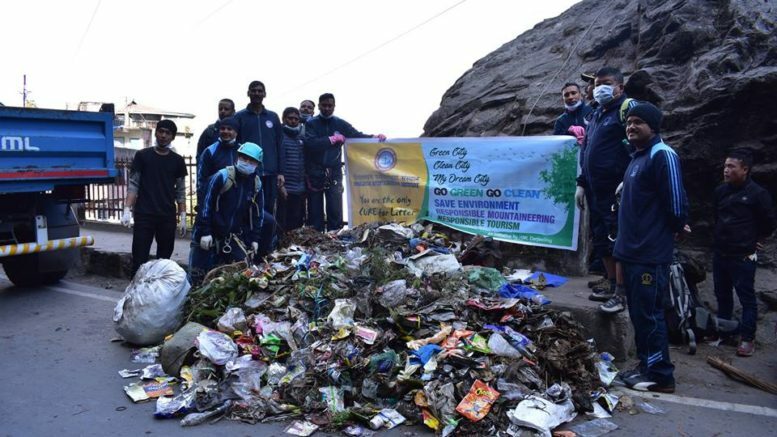 Darjeeling throws up 30 MT to 35 MT of trash a day, which can double during peak tourist season, said Sagar Tamang, vice chairman of the Darjeeling Municipality. However, Rai said the volume of waste increases in the tourist season but even without them, it is a pretty grim picture in terms of what is done with the waste. “With the change in the profile of waste that has come about, it has magnified dramatically as the amount of single-use plastics, tetra packs, and PET bottles have increased a huge amount,” Rai said. “Given the hilly terrain, once they are littered it is extremely difficult to retrieve the waste, water washes away the trash and the monsoon doesn’t help,” said Rai, advocating looking at national policies in slightly different ways. Tamang informed that there are plans to link up the trash deposited in the Dumping Chute with the biogas plant. “We have started addressing the problem by starting segregation at source. From hotels too we are collecting the trash directly,” Tamang said.